Call Prescription-Air Cooling, Heating, and Air Purification for your furnace, boiler, air conditioner, or heat pump repairs and service. Keep your castle cool in the summer and warm in the winter. Call Prescription-Air Cooling & Heating for expert advice on how. At Prescription-Air Cooling & Heating, we specialize in keeping our customers comfortable. That means we do everything from regular heating and cooling equipment check-ups to emergency service to recommending and installing new equipment. If you have any heating or cooling questions or problems, you can count on our trained service team for prompt answers and service. Don’t forget, regular maintenance can help extend the life and performance of your existing equipment. Be sure to ask about our special maintenance service programs. Should you need new equipment, we offer a full line of dependable, energy-efficient Maytag heating and cooling products and accessories. We can analyze your comfort needs to determine which products will provide you with optimum comfort and value. With Prescription-Air Cooling & Heating, your comfort will extend well beyond the temperature of your home. Prescription-Air Cooling & Heating provide only the best home comfort products and service. Our Experienced, Factory-Trained technicians can take care of anything from heating system maintenance to emergency air conditioning repair to a new installation of a furnace, boiler, heat pump, air conditioner, or geothermal system in your Cincinnati home. We keep you informed of your options and our progress along the way and we do whatever it takes to get the job done right. We will make sure you are completely satisfied with your home heating, AC, geothermal or indoor air quality system So give us a call today (513) 531-FAST (3278) for all of your home comfort needs. Prescription-Air Cooling & Heating is the place to come for all of your heating needs in Cincinnati, Ohio. If you need 24 hour emergency service, we will be there for you. We perform award winning service every day—on your schedule. Are you in the market for an entirely new system? We’ll work with you every step of the way. If you want to make sure your home is as comfortable as possible all winter long, give us a call today. Keeping your home cool in the summer is definitely an important concern and the first line of defense is to have us perform a Precision Tune Up on your air conditioning system. This Tune Up will often find small problems before they cause a complete shut-down of your cooling system during the dog days of summer. If you would like to upgrade your air conditioner, we’ll work with you every step of the way to make sure you wind up with the right air conditioning system for your home and that it continues to work well for you for years to come. And we can also help you add the extra details, like zone control systems, programmable thermostats and annual maintenance that will allow you to get the most out of whatever air conditioning system we install for you. 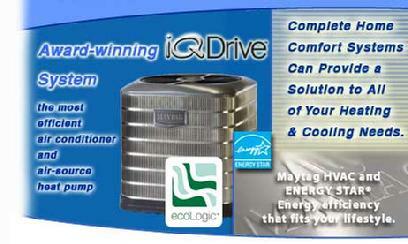 We are also Cincinnati's premier installer of the award-winning IQ air conditioner and heat pump. Geothermal home air conditioning and heating systems qualify for up to a 30% tax credit and are great for keeping energy costs down while keeping your home comfortable year-round. We provide the best all-around geothermal service in the business. Whether you’re interested in having a new geothermal system installed or you’ve got an existing system you’d like us to perform maintenance or repairs on, Prescription-Air Cooling & Heating has the knowledge and experience needed to get the job done right. Maintaining the quality of your indoor air at a high level is a real concern these days and something we take very seriously. That’s why we offer a full range of products like air cleaners, purifiers, filters and humidifiers and our allergy-killing RxAir whole home air scrubber solution. We have a vast knowledge of air-purifying solutions. This knowledge of air purifiers and air filters was driven by a personal experience. See our RxAir page for more information. Prescription-Air Cooling & Heating performs ac repair, furnace repair, boiler repair, heat pump repair. We offer air conditioner, gas furnace, electric furnace, heat pump, steam boiler, and hot water boiler service and replacement. We repair and service all makes, including Maytag, Lennox, Bryant, Carrier, Goodman, York, Amana, Janitrol, Cincinnatian, Luxair, Frigidaire, Gibson, ADP, Swallens, Honeywell, Armstrong, Trane, Rheem, Ruud, Heil, Payne, Coleman, Spacepak, Unico, Weil Mclain, and many others. We serve the Greater Cincinnati Area.